Oh Hell we found the cold. 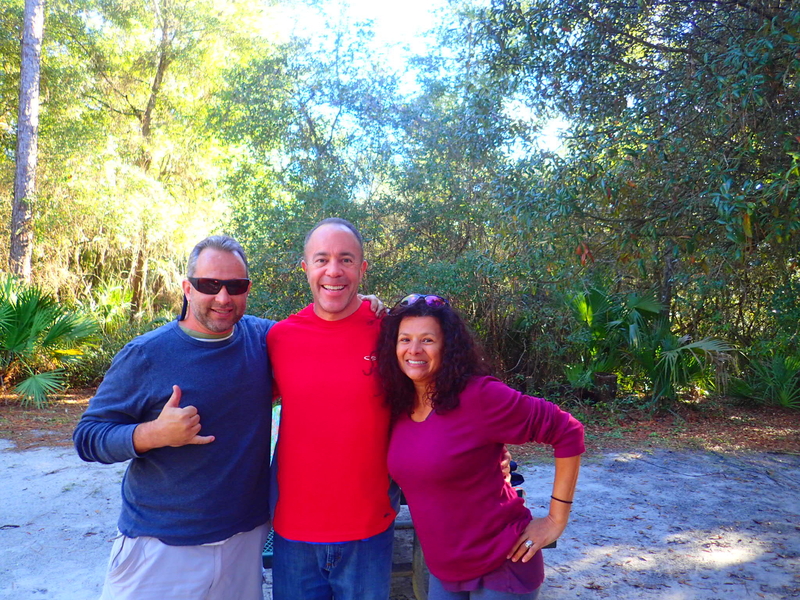 Venice, Geneva, Wekiwa Springs, Ocala National Forest and Homosassa. After decades of living in south Florida we have both lost any semblance of cold tolerance, and thus we are suffering a bit in what most would consider the very mild, even temperate weather of north central Florida. The cold and windy snap fo the last week has forced yet another round of digging through and reorganizing the storage compartments in order to retrieve our fall and winter clothing. The up side is that we found a few more items to donate or sell, opening up a bit of maneuvering space in the storage areas. 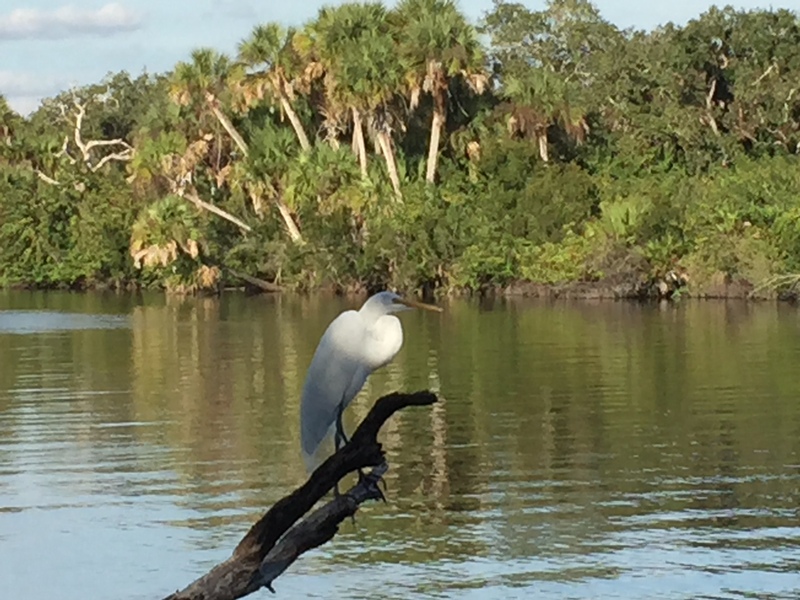 Ramblers Rest Resort, Venice, FL: As we have mentioned, this is one of our favorite private parks. A mixed community of mobile homes, park models, and RVs with a very active community and daily activities. It is also conveniently located near Rose’s mom, Gloria and her husband, Bill. Initially assigned a premium spot away from the water in the RV section, we requested something down close the river in the midst of the mobile homes. They accommodated us, though we had to accept a spot with only 30 Amp hookups vice 50, and no sewage set up either. Unlike some of the very large rigs, we have never had a problem living off only 30 amps, we just have to remember to not turn on both ACs. altough given the weather shift, that was hardly a problem. We enjoyed a great three day stay, meeting Bill’s son and daughter and their significant others, attending niece Laura’s talent show, and an evening listening to oldies performed by a casual gathering of Ramblers Rest musicians that get together every Saturday night to perform for whomever wants to show up. 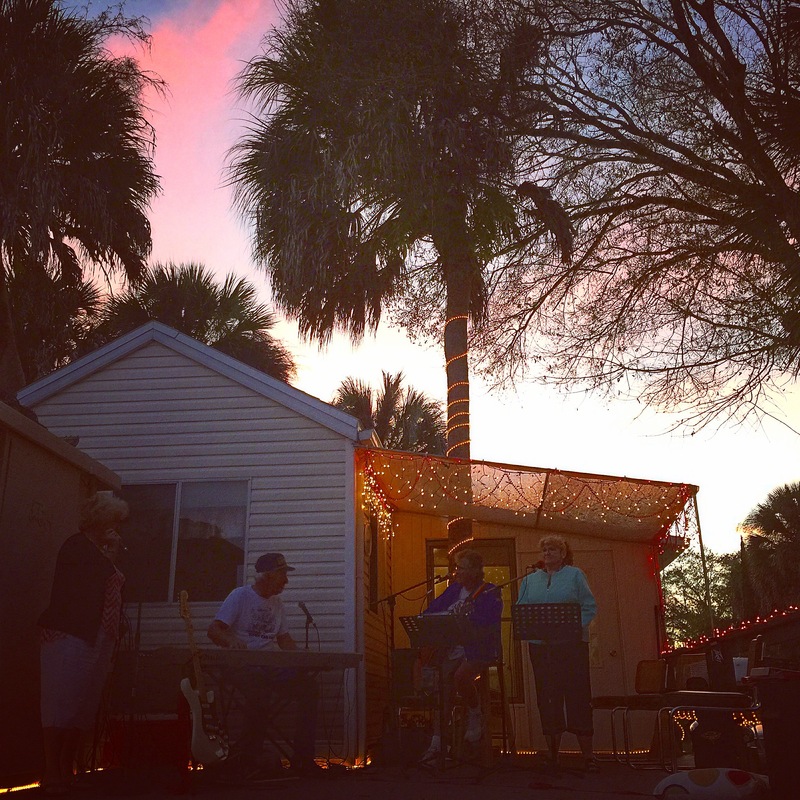 Uncle Bob and Aunt Terri’s, Geneva, FL: Not only did they provide us with a free spot including electrical hook up, but they let us borrow a car and abuse their laundry machines to our hearts content. As always, it was a great visit, and we got to see my son and daughter in law as well as the Pineras, childhood friends of Rosie. 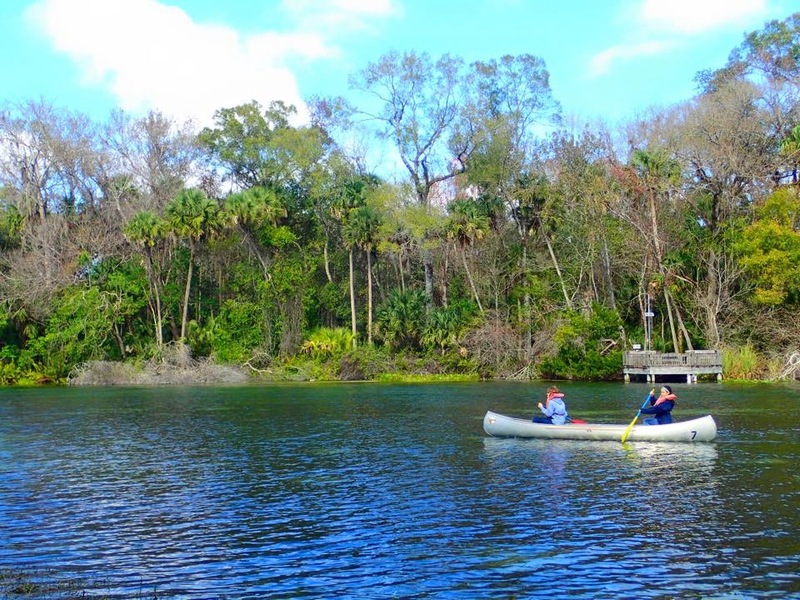 Wekiwa Springs State Park: As a child and young man I visited this park dozens of times, but this was the first time in an RV. It must have been the only time I have ever been while school was in session, because for one brief period I had the entire spring to myself. 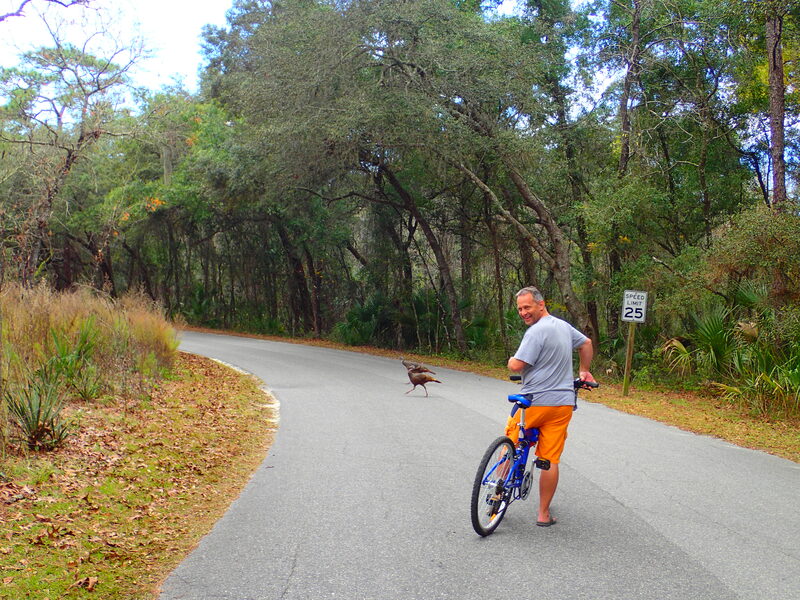 We did a bit of biking and geocaching, during which we were passed on the road by eight wild turkeys. Aunt Judy and cousin Justin visited us one evening for stories and a glass of wine. This is the first park were the cold started to impact us a bit, but our AC heating strip and hot water heater kept us cozy. 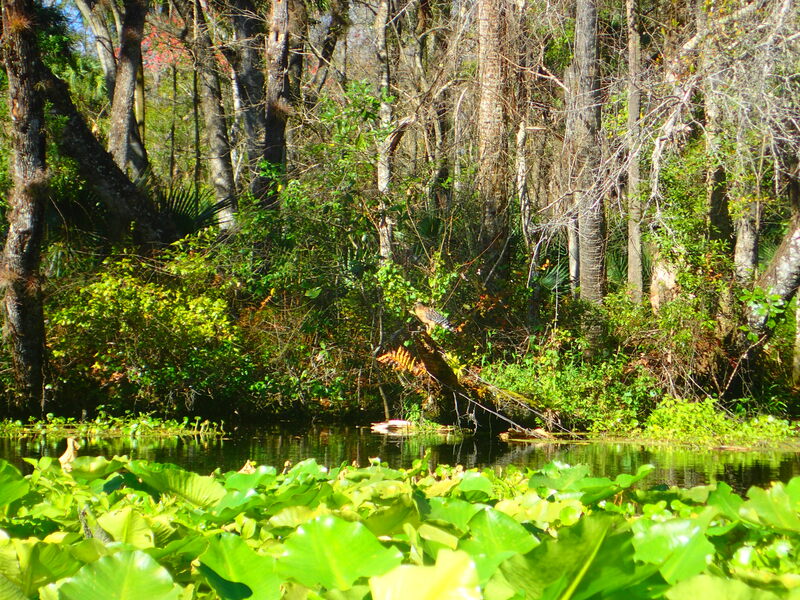 Alexander Springs, Ocala National Forest: What a fantastically beautiful park, the spring is even more beautiful than Wekiwa, and with the RV park conveniently located much closer to the actual spring than it was in Wekiwa. Again I had the entire spring to myself for a dip. The downside is we paid $24/night, basically for dry camping: no electrical, water, or sewage hook ups at all, whereas at Wekiwa we paid $3 more per night and got electricity and power. That may determine where we visit next year, but it was great practice for our planned boondocking out west. The wind was pretty stiff, but we still enjoyed some geocaching, biking, and swimming. The Torres clan, Anthony, Angel and Bella, along with a schoolmate, visited us and braved the gusts to take Rosie out canoeing. Natures Resort, Homosassa, FL: First, I want to point out that despite the coincidentally similar name, this is not a nudist resort. 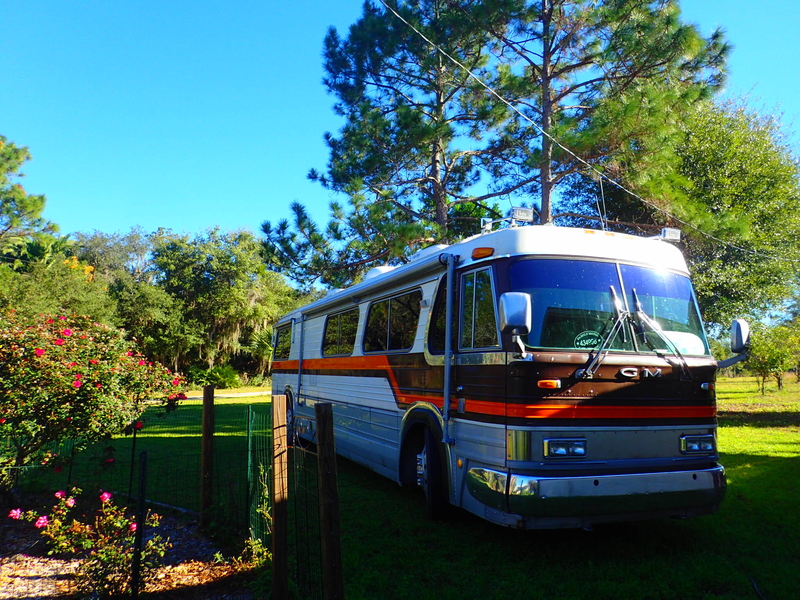 It is a fantastically located RV park very close to the Ellie Schiller Homosassa Springs, a major manatee gathering spot. Unfortunately the weather was extremely windy, with 30 mph gusts most our stay. 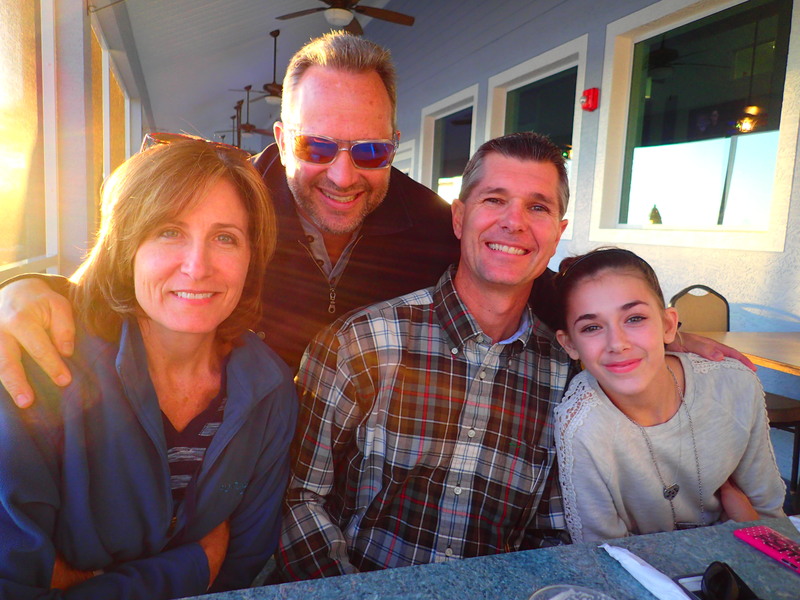 We used the time to instead visit with Aunt Chris and Cousin Carlyle and her family, Alex, Allie and Hailey. They took us out to dinner the first night, and we gathered at their nearby home for dinner the next, with Alex graciously providing not only high-end tequila, but also several of his salmon steaks from his recent fishing trip to Alaska. Natures Resort is, as I said, in an excellent location, but the roads are very narrow and the RV spots pretty tightly packed. If you have a small boat, a number of the sites like ours on the canal and river side have personal docks for each spot. We wish the weather had been better so we could take advantage of it.